Located below the ever plush Kempinski Grand Hotel Geneva you will find one of the few jewels in the crown of Geneva nightlife – Java Club Geneva. From my experience talking to Geneva locals this is a place that people either love or lathe. Java Club is renown for attracting Geneva’s young and rich, drinks come by the bottle and you won’t find too many ugly people inside. No doubt this can be a place with a strong emphasis on image, but if you want to hear Geneva’s best house music (including regular apparences by international dj’s) with a crowd that’s up for a party most nights of the week, than this is your place. I was in Geneva between Christmas and New Years during the “Festival Arbres & Lumières” . Not too disimilar from the Vivid festival that lights up Sydney in during June. 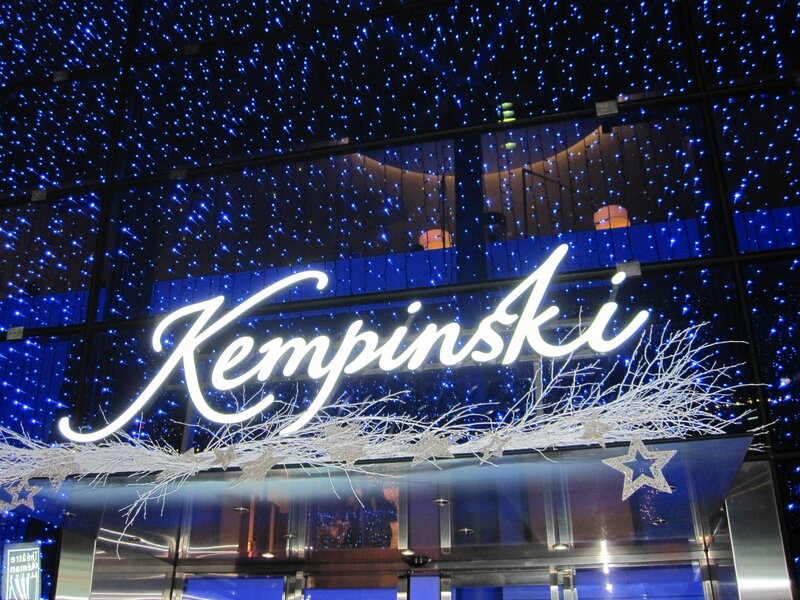 The buildings were all animated in cleaver illuminations and light installations and it was a very “UV Blue” Kempinki that greeted with it’s flashing light display reflecting off the snow. It was already after midnight by the time we got there (and we had a train to catch at 7am) so we skipped pre drinks at the Floor2 Bar as most do, and ushered ourselves straight down stars to the doors of Java Club. We were welcomed warmly English and our coats taken to be cloaked – this was good service. 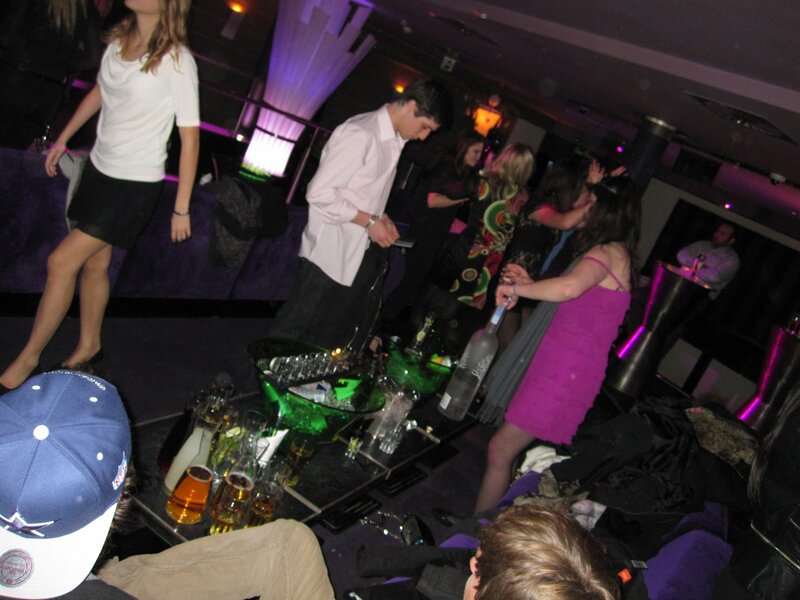 There was no cover this night, however I believe on busy nights it is something like 60CHF* to get in. This is why some of the locals don’t like it here. 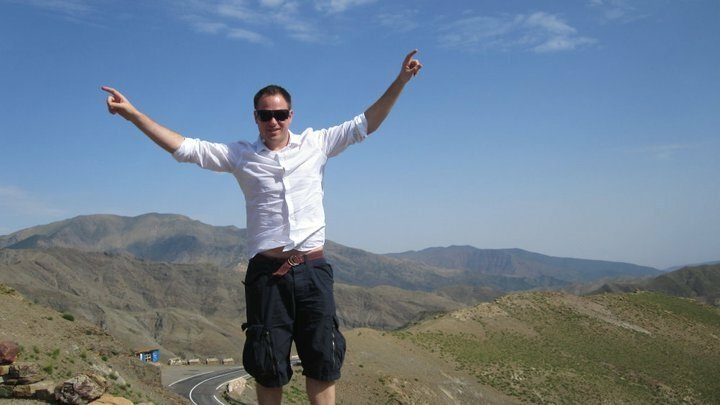 If you’ve already been to Switzerland you will know just how expensive it is. Well this is a place that even the Swiss think is expensive. And we were about to find out just how expensive it was. My friend ordered some drinks for us, a botte of Corona and a Flute of champagne (Dom) was over 75 CHF. I was expecting expensive but that really took me by surprise. There was only one thing that caused for this, and that was to get a table and bottle of Vodka. 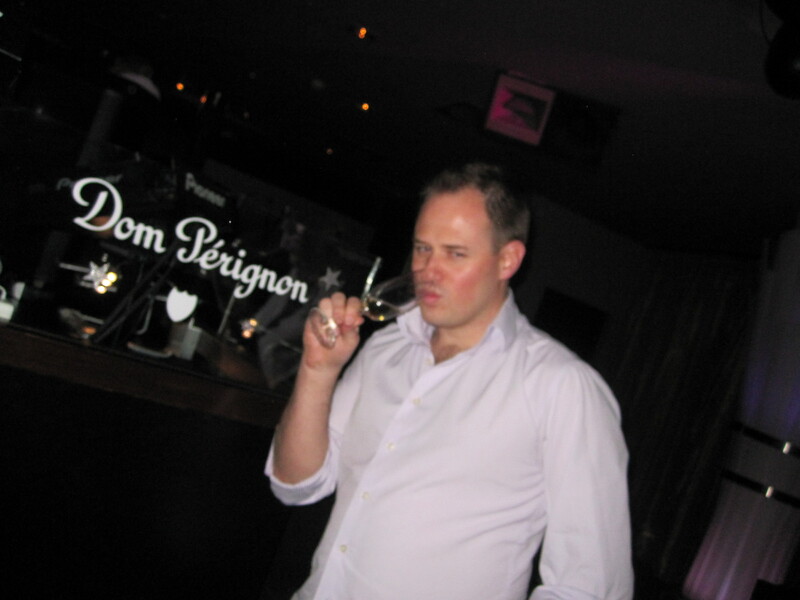 Posing like a wanker, but this was my first time drinking Dom, so why not? Half a bottle in and behaviour standards have began to drop. quickly ushered off to a waiting table. The reserved sign removed and drink menus passed out all around. Again the price shock continued here and we ended up getting the “poverty pack” a 750ml bottle of Abosulte for a ‘measly’ 300CHF. But it would only around 3 rounds of buying drinks at the bar to amass a bill that large and we would of hardly been drunk so in actual fact this is actually much better value for money – so long as you can put it out of your head that the same bottle from the shop outside is more than 90% cheaper. 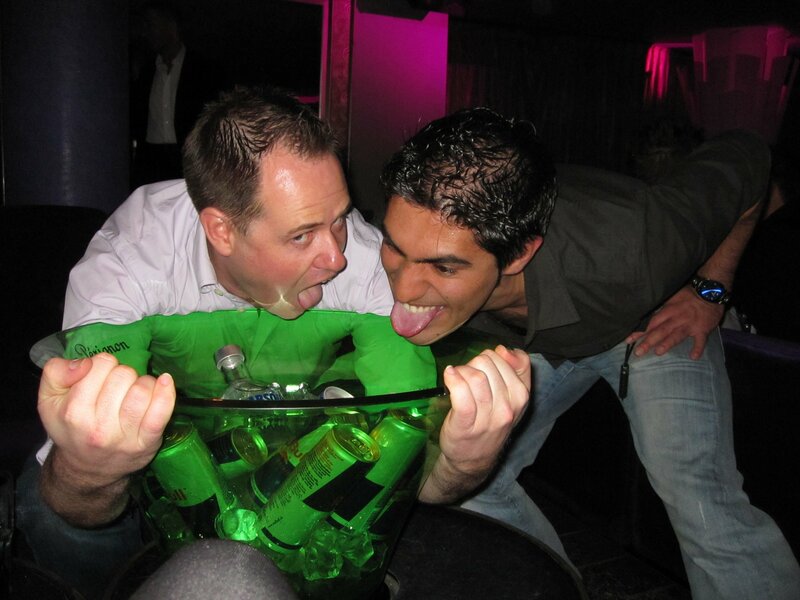 I have to give props here to my mate Rishi here who decided to shout our group the bottle as a thank you gift for an awesome Christmas in Chamonix and a soon to be awesome NYE in Dusseldorf . 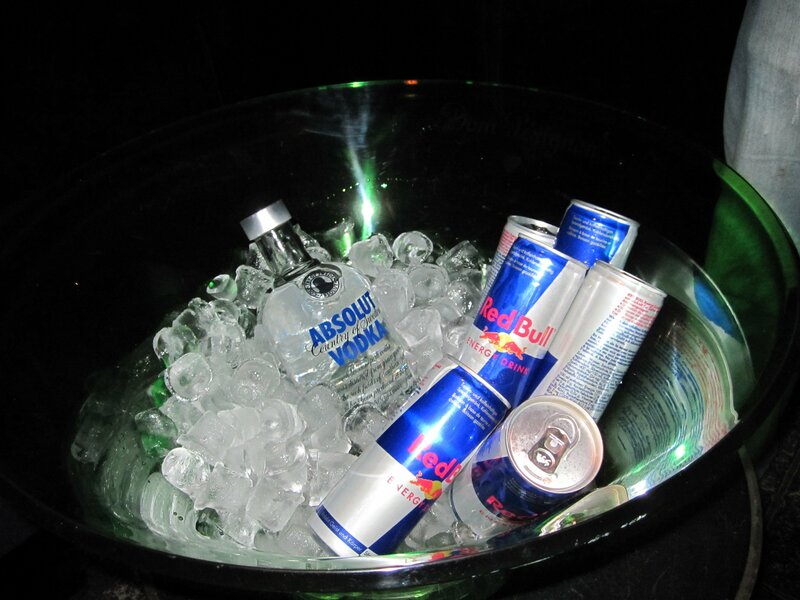 So here we were thinking we are pretty awesome in our VIP area (even had a big silver VIP sign) with our bottle of vodka on ice and Red Bulls and mixers primed and ready to go on the side, when a bunch of 19 year olds enter the club and take the table below us. They were followed by a waitress holding a metre long plank of shots (similar to what you see at German restaurants) and then another waitress holding a bottle of Belvedere that must’ve been 1 metre tall with sparklers glowing out the top of it. If our small bottle cost 300 CHF, it’s possible that there was at least $1000 on the kids tables that probably haven’t even started uni yet. It was a quick reminder that we weren’t the pimping Swiss investment bankers we thought we were that night, but just regular people from Australia on the trip of a lifetime. Half a bottle in, and things are starting to get crazy and our time is now divided half between the dance floor and table. We met a few of the other club goers. Surprisingly most that we met were from over the border in France and had come down from the hills for a party. The table next to us was occupied for awhile by some older gentlemen who bought a bottle of Verve, drank a glass each of it, and left the rest there. I was so tempted to take it, but my peers restrained me thinking that the old guys might come back. But they never did and a waitress came along took the champaign and likely poured the rest of a 400 Franc bottle down the sink. Before too long it was time to leave and say goodbye to our new Swiss and French friends. ushered out at closing time there was a a fleet of limos and black German sedans waiting out the to pick up the 19 year olds I mentioned earlier. Meanwhile we walked up the snow streets back to our hotel kept warm by our “Vodka Jackets”. 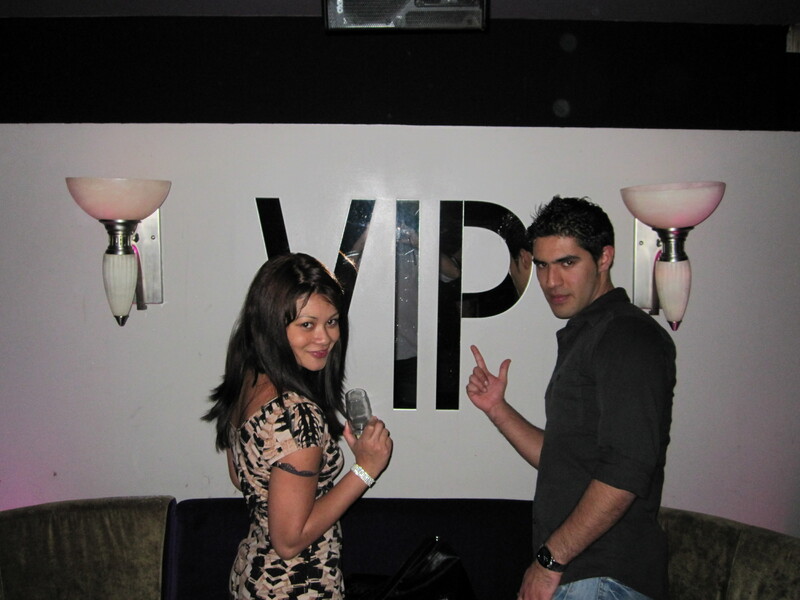 This entry was posted in Europe, Parties, Travel and tagged bottles, champagne, clubbing, expensive, geneva, hotels, house music, switzerland. Bookmark the permalink.